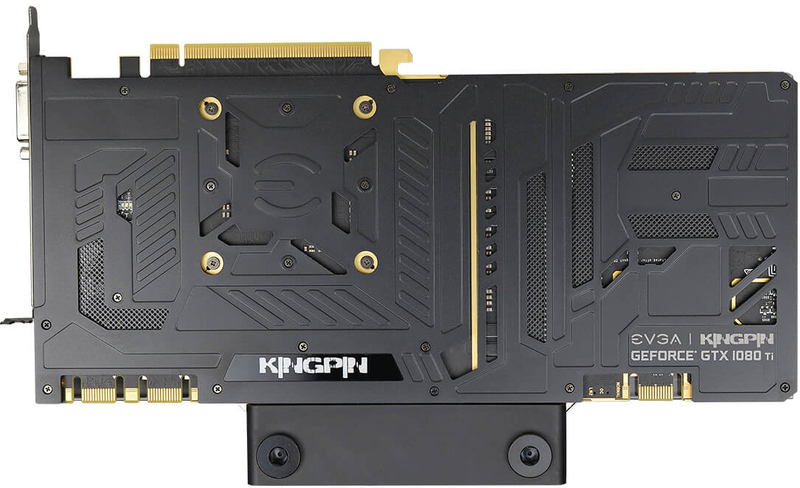 EVGA has released a version of its custom-built GeForce GTX 1080 Ti K|NGP|N video card with a pre-installed bespoke water block. Courtesy of EVGA's customized selection of video outputs, the card now takes only one slot and therefore can fit into tightly packed systems featuring custom liquid cooling systems. EVGA continues to guarantee that the card’s GPU can be overclocked to over 2 GHz, meaning that what was already one of the world’s fastest video cards now has a factory-installed liquid cooling option. 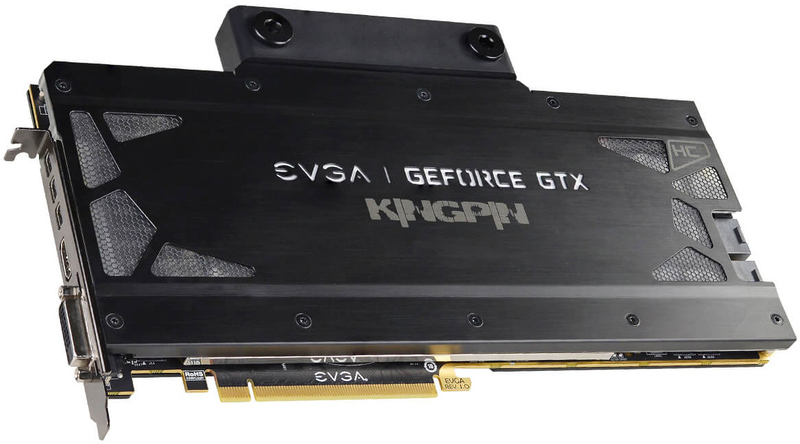 The liquid-cooled EVGA GeForce GTX 1080 Ti K|NGP|N Hydro Copper graphics card uses the same PCB as the air-cooled original one. The board was designed for overclockers and overclocking: it features a 14 phase digital VRM, 11 thermal sensors in total in critical locations on the PCB (5 on the VRMs, 4 for the vRAM, and two on/near the GPU itself), an EVbot connector for easier volt modding as well as three BIOSes (normal, overclocked, and LN2) that can be activated when needed. Since EVGA guarantees that NVIDIA’s GP102 GPUs on all GeForce GTX 1080 Ti K|NGP|N Hydro Copper graphics cards can be overclocked to at least 2025 MHz in boost mode (up from 1695 MHz out of-the-box), the 'overclocked' BIOS setting is going to be default for most owners of the new card. The EVGA Hydro Copper waterblock designed specifically for the GeForce GTX 1080 Ti K|NGP|N video card covers the GPU, memory and VRM, it is made of nickel-plated copper with an acrylic cover and aluminum on top. The waterblock is equipped with a hub featuring six connectors for easier installation of tubes as well as a glowing EVGA logotype on the front. To ensure that the card does not bend after a long usage, the graphics card is equipped with a custom backplate designed for EVGA’s GTX 1080 Ti K|NGP|N (KPE). It is noteworthy that the waterblock can be purchased from EVGA separately for $219.99. Apart from its overclocking capabilities, configuration of video outputs is also an important selling point of the GeForce GTX 1080 Ti K|NGP|N Hydro Copper. The card has three Mini DisplayPort 1.4 connectors, an HDMI port, and a DL-DVI-D port, all located in one row. This enabled EVGA to shrink the liquid-cooled graphics card to just one slot while still offering a DL-DVI port, which may be important for those who run tightly-packed systems with multiple add-on cards and a custom-built LCS. 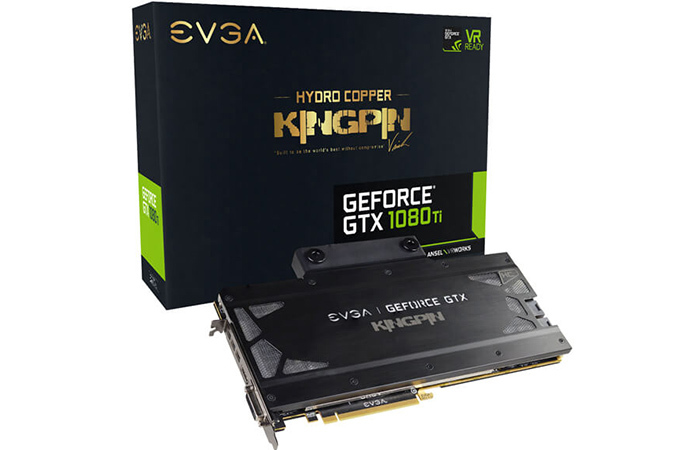 Just like the original GeForce GTX 1080 Ti K|NGP|N edition from EVGA with ICX air cooling early in its lifecycle, the EVGA GeForce GTX 1080 Ti K|NGP|N Hydro Copper is only available directly from the company. The price of the card is $1249, which is $250 higher than the price of the original board. 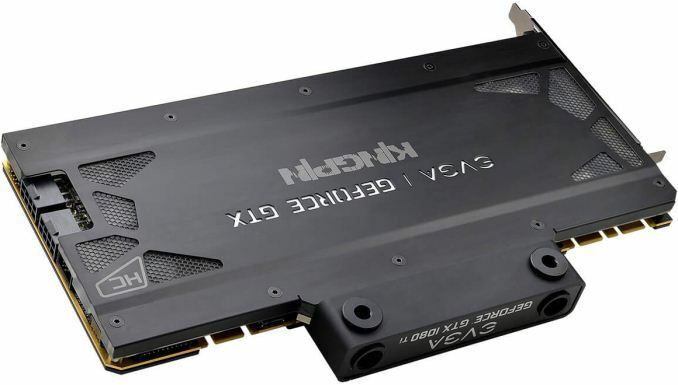 Meanwhile, EVGA itself did not have any GTX 1080 Ti K|NGP|N edition with air cooling in stock at press time, whereas Amazon’s partners offer such cards for $1299. $1300 bucks and it doesn't even come with a fan. PFFT.